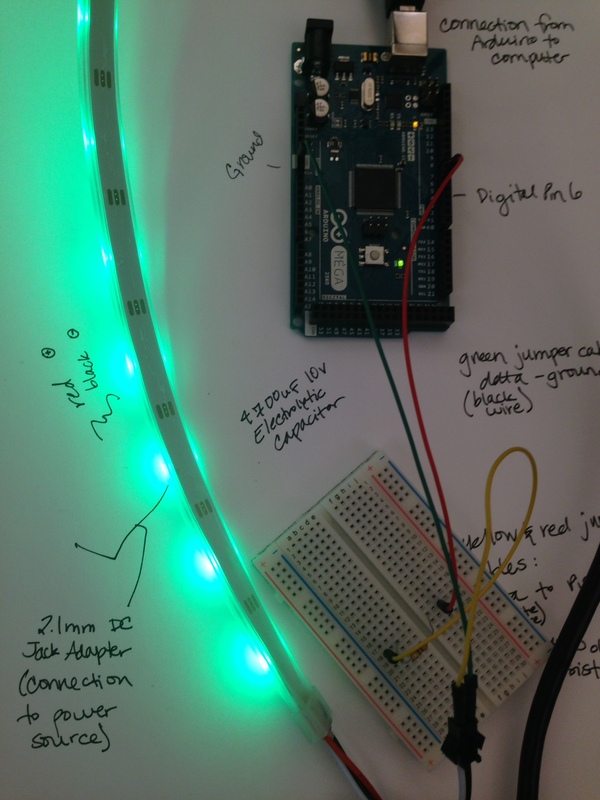 There is extensive documentation on NeoPixels, including a very handy “überguide”. It is written assuming experience with Arduino/electronics. I would recommend following this, and using this post for clarifications. While I’ve had a reasonable amount of experience, I would still classify myself as a “beginner.” The biggest problem we encountered in setting up the NeoPixel strip can be attributed to not recognizing that small screws can fasten things together…now it seems obvious. For expert users, I might be oversimplifying this, but it should help beginners. The NeoPixel strip has 4 connections, two for the additional power supply and two for data. For power, the red cable is connected to the positive plug of the adapter, and the black cable is connected to the negative plug. In addition, a capacitor is attached matching the positive and negative sides. This might not be needed, but it’s probably a good idea. To attach all of these things together, you can either solder or place all the ends of the cables in the little holes of the green part of the adapter, and tighten the little screws to keep everything together. The other black cable goes to ground (GND) on the Arduino board, and the white cable goes to Digital Pin 6 on the Arduino board. (It can actually go to just about any digital pin, but the example code uses 6). It is also recommended, that you use a 470 ohm resistor in between the white cable on the NeoPixels and the digital pin. 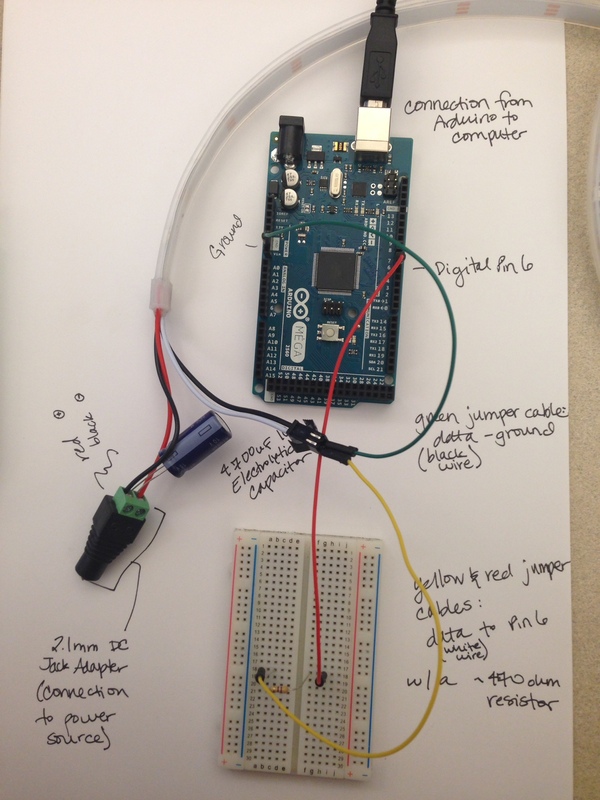 To do so, use an additional jumper cable and a breadboard.